Start from the east exit of Ikebukuro Station. Walk along Meiji dori towards Oji. 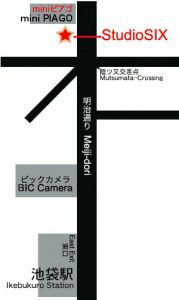 Pass the following landmarks: BIC Camera, Yamada Denki, and MOS Burger until you reach a huge intersection (Mutsumata Kosaten) with a highway overpass. Cross that intersection and keep walking along for another 50 meters. The dojo is located on the tenth floor in the building adjacent to the Piago Convenience Store. Caution: If you find yourself crossing a bridge over railroad tracks you have walked too far. Go back to the building next to the Piago Convenience Store.